Eyeing an overseas career move or considering an exotic retirement? Choose your new homeland wisely. Mercer's 2013 Cost of Living Survey ranks global locations for expatriates. 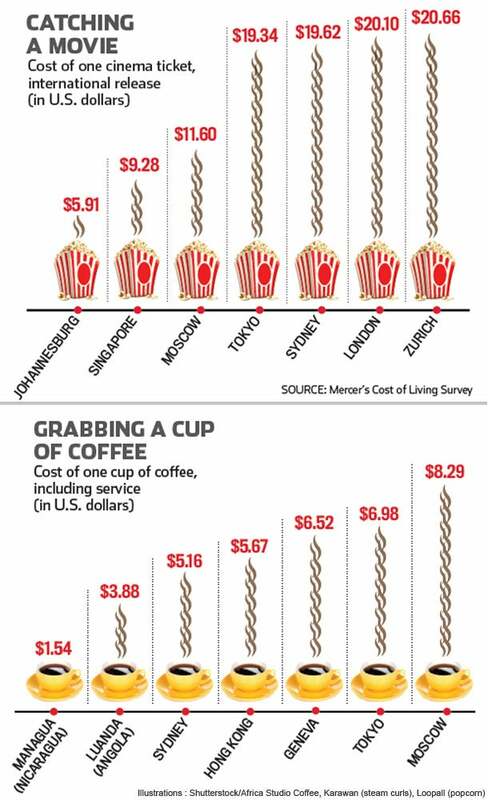 Among the 10 most expensive are Moscow, where a cup of coffee will set you back the equivalent of $8.29, as well as Tokyo, Singapore, Hong Kong, Sydney and the Swiss cities of Geneva, Zurich and Bern. But the world's highest cost of living for expats? Luanda, Angola, where a two-bedroom unfurnished apartment rental costs $6,500 per month, and prices for transportation and imported goods--an international daily newspaper goes for $5.42--are exceptionally high.